In a few hours I begin a pilgrimage. In a few hours I begin the last leg of a pilgrimage that I unknowingly (and very much unwillingly) began almost four years ago. In truth, in a few hours I am boarding my first of three flights that will cover countless miles, cross oceans, and deposit me directly into a place where I already am—The Unknown. 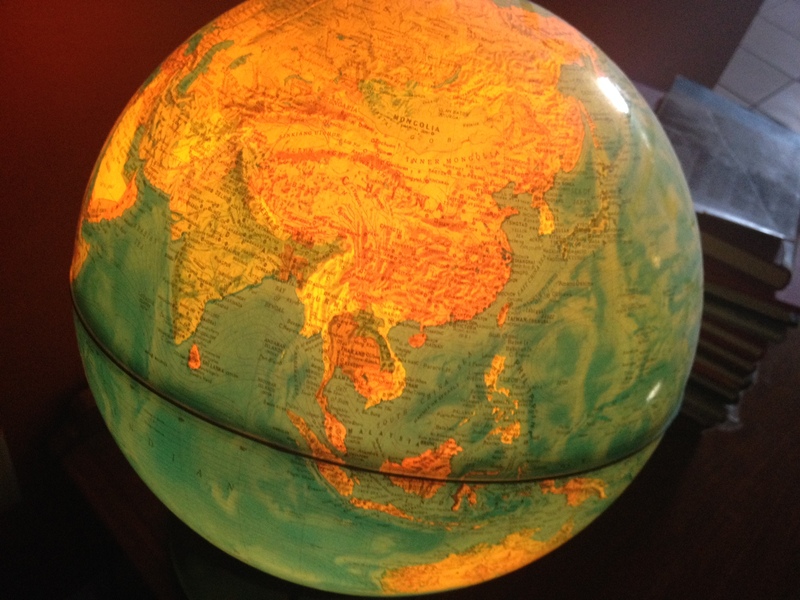 I used this antique light up globe to show my kids my pilgrimage journey’s route. Pilgrimaging to Myanmar is a requirement for the program I am in at Central Baptist Theological Seminary. As we prepared (preparing!!! as I have not finished packing) for this pilgrimage we were instructed that pilgrims are not tourists. As a tourist I have planned epic road trips with my kids that included itineraries with such detail that it included the exact mileage to be driven each day, hotels’ fax numbers, admission fees for the attraction of the day, etc. I love my road trips with my kids, but what I have learned is this: with such detail I practically have already lived the vacation prior to mile 1. I also lose some of the adventure. I decided that this trip…er, I mean pilgrimage…would be different. I would purposefully not be a tourist. I have let go of the control that a detailed itinerary gives me. I don’t even know where I am staying in Thailand (thankfully, my program leader does, but I don’t). THIS SCARES ME LIKE CRAZY. And it’s exactly what I need. Control is what I am letting go of for this pilgrimage. Sometimes I wake up and don’t even recognize my life. It’s so different than I had planned or imagined or ever thought possible. Sometimes I think it’s better than I planned. Sometimes, not so much. This is why I consider this the last leg of my four-year pilgrimage; it’s my final undoing in this chapter of my life. The undoing by snipping unseen tethers. Before I departed to study in Oxford my dad told me a great truth: culture shock happens more often in places where they speak the same language because the tourist expects things to be similar because of the common language. Unlike, say, for those traveling to Asia because you know it’s different. Here’s my truth for this moment. My life has me in “culture shock.” I swear I speak the same language; yet, it’s so different. So…unknown. My hope on this pilgrimage is that as I take this sacred journey to the other side of the world…to the truly unknown…that I will return to what is truly mine. In “The Great Letting Go” of pilgrimage I can return to…me. Safe journey…and plan to welcome YOU home!